As I had mentioned previously in my review of Koko Head Cafe, it seems the hipster food movement is rising rapidly in Honolulu. The Pig & The Lady is another such restaurant, that manages to shine brightly amongst the plethora of restaurants in the city. 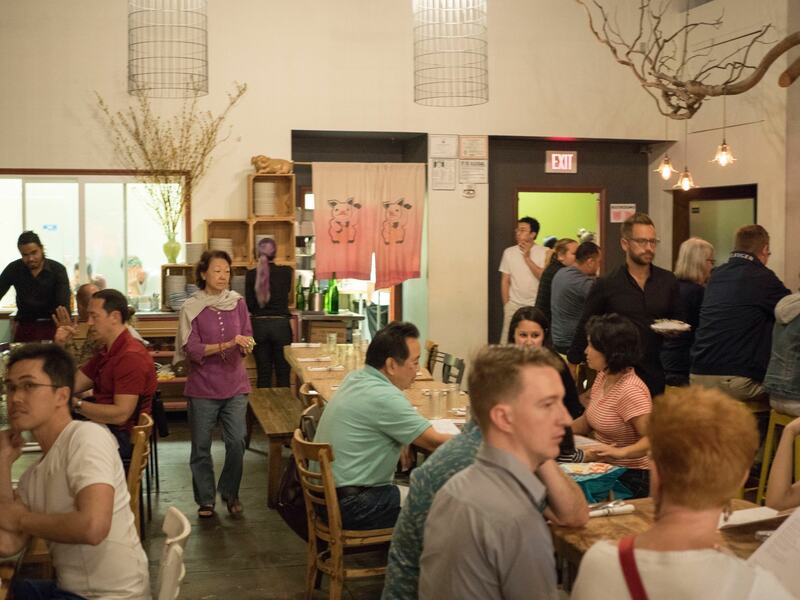 Originally started off as a pop up stall in farmers markets, The Pig & The Lady has since won over the hearts of many diners in Hawaii, which led them to open their flagship restaurant in the heart of China Town, Honolulu. Since then, they’ve been featured across various media, and have also won the praises of diners spanning across the mainland of the United States. 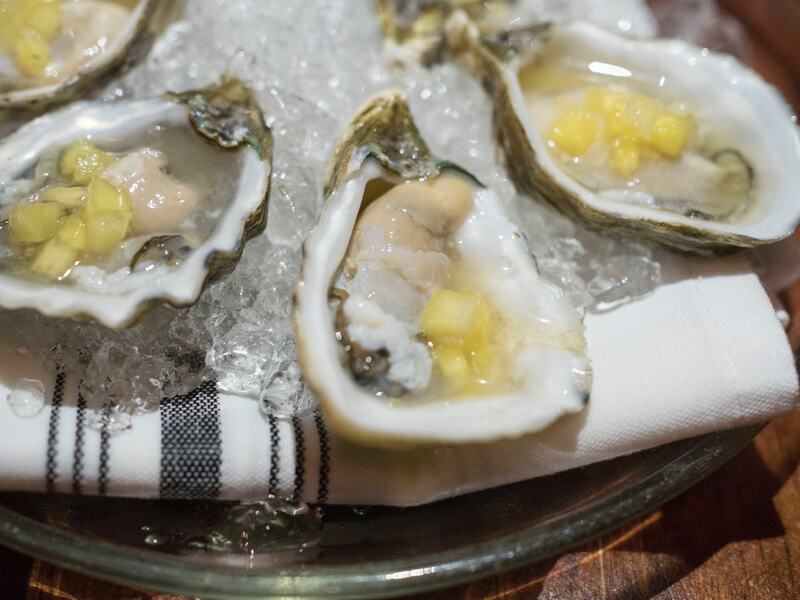 At the time of writing, they are preparing their second restaurant in Honolulu. There are plenty of immigrant mom and pop restaurants in Hawaii, but The Pig & The Lady is a ‘Mom and Son’ shop. The Pig, referring to the son, Andrew Le, whilst The Lady is the mother behind the core of the recipes, Mama Le. Andrew’s brother, Alex runs the restaurant as Manager, whilst the rest of the staff work together, closely knitted like a family. They are, quite an inspiration. We were lucky to be able to get a reservation on 2 days notice at 6pm. When we arrived, there was almost a mob at the front of the restaurant, eagerly waiting for seat openings. Thankfully, we were ushered right in, past the eager diners eyeing us with envy. The restaurant seems to have been remodelled from a loft type of space, with super high ceilings and brick walls. Although the lighting was a little dim for a family place, it remained cozy. As with many restaurants I’ve visited in the States, service is usually commendable. However, be prepared to wait for your food, which I have no problem with, as long as the food is worth the wait. 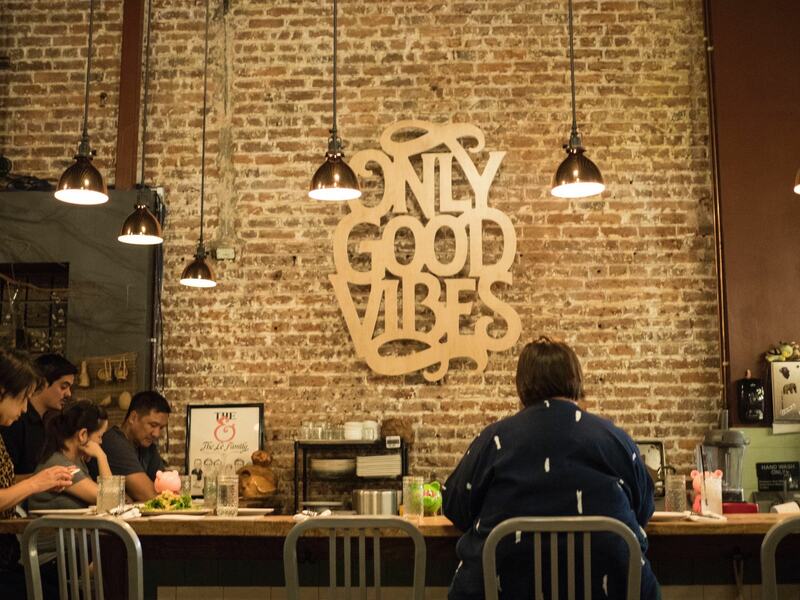 The cuisine at The Pig & The Lady is a mix of traditional vietnamese elements with modern techniques and ‘New American’ cuisine. Mama Le provides the foundation of the Vietnamese elements, while Andrew shows off his culinary school chops. 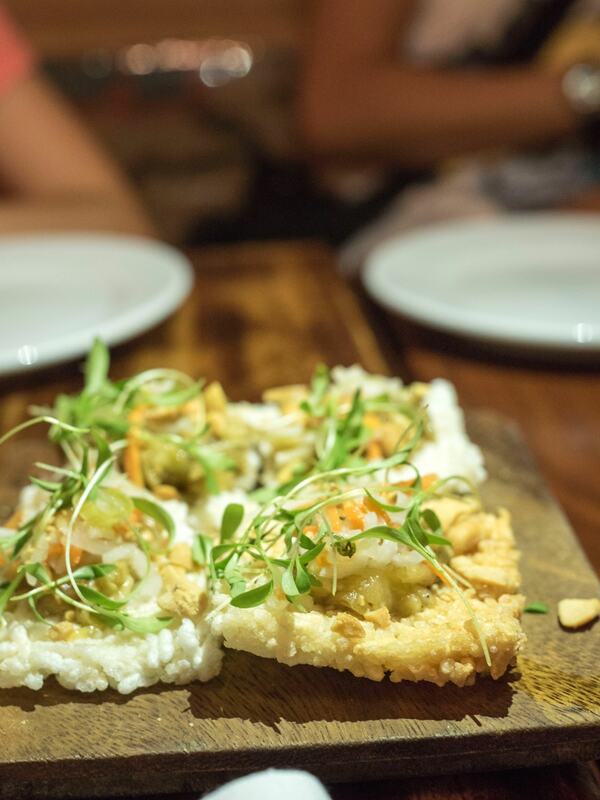 Puffed Rice Crackers, Nuoc Mam, Scallion Oil. 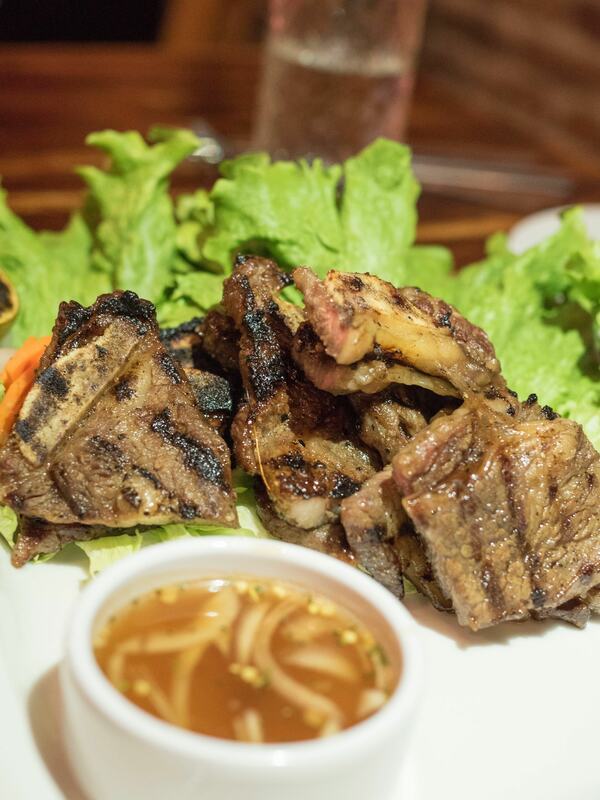 We picked the Kalbi Short Ribs from the grilled menu. It was certainly surprising to see a korean type dish on the menu. Thankfully, the ribs were well marinated, and grilled beautifully with a lovely charred flavour, while the meat was moist and tender. A vietnamese style fish sauce dip was provided as accompaniment. 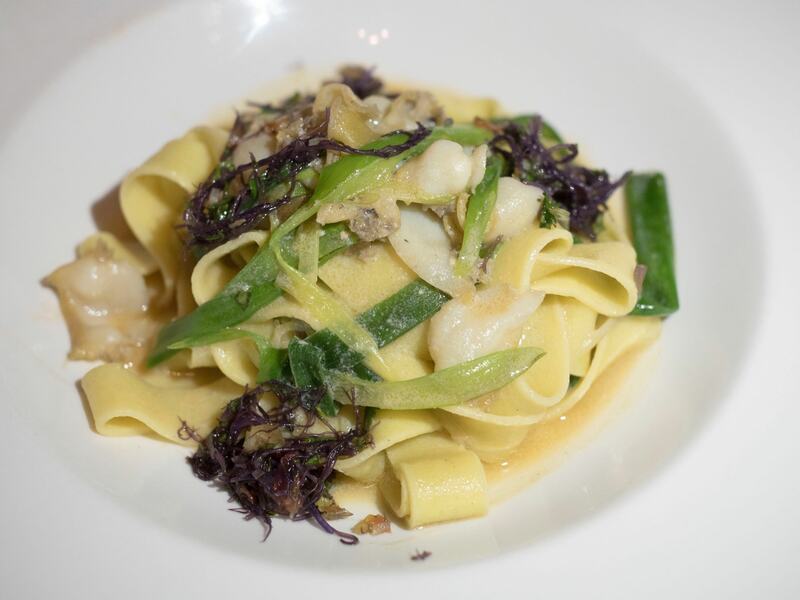 Tagliatelle, Lobster broth, local tomatoes, jalapeno and Tokyo negi. Tagliatelle, roasted black trumpet mushrooms, winter perigord black truffles, braised in chicken & porcini jus. Black trumpet mushrooms were a new thing for me to taste, so I was very curious about this dish. 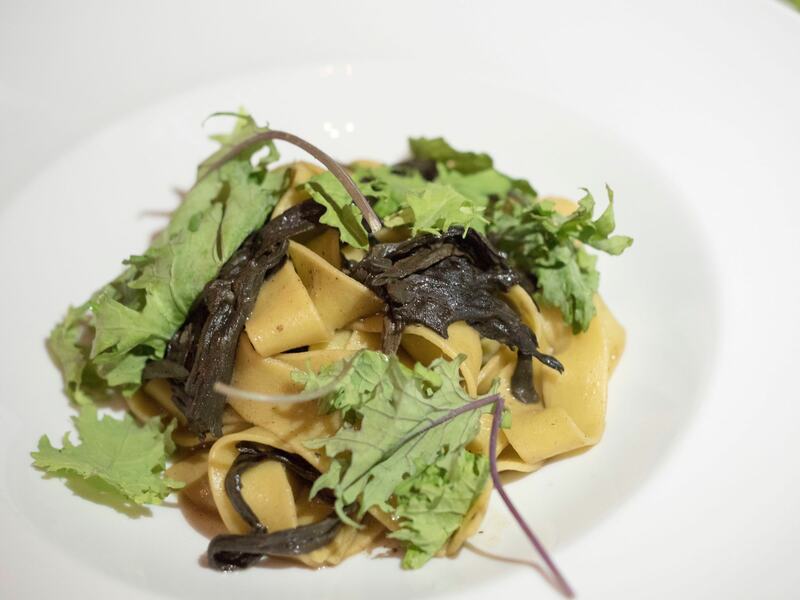 I thought it was interesting to scatter some leaves of young kale over the pasta, perhaps to add more nutritional value to the dish, because the kale didn’t add much flavours nor texture. Big island beef, 12hr brisket, rare beef, smoked bacon, charred tokyo negi. 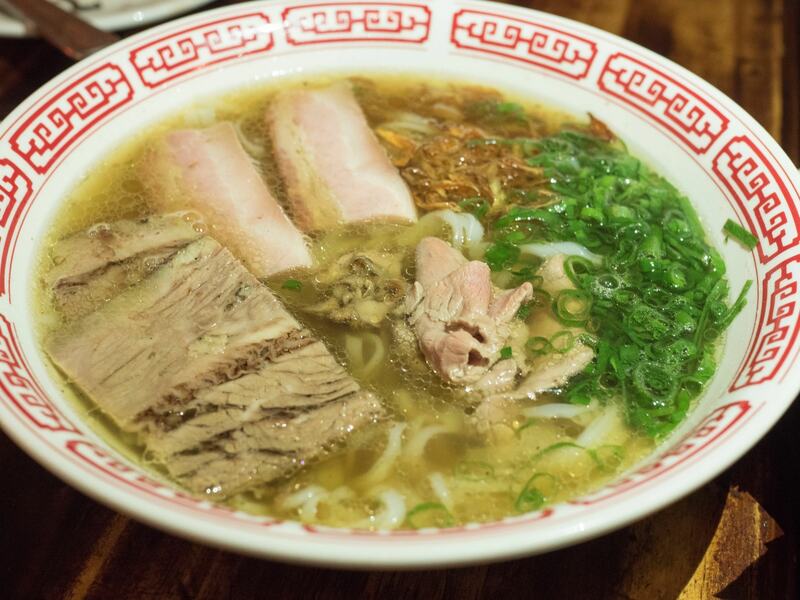 How can you visit a vietnamese restaurant without trying their Pho? To be honest, what caught my eye was the variety of big island beef cuts featured in the pho. A broader flat rice noodle was used instead of the more common thin version. 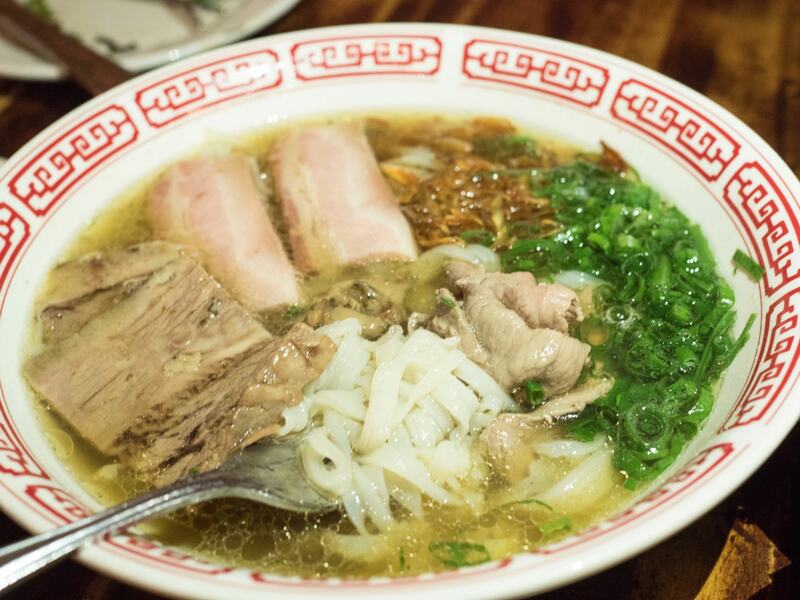 Both versions are considered authentic, depending on the region where Pho is served. The soup was fantastic. Full of flavour, savoury but without the characteristic MSG after-taste. Portions was quite ample as well, unlike the pastas. The brisket was naturally very tender after being cooked for 12 hours, so was the rare beef, which had a nice cushiony bite in the mouth. The smoked bacon provided a strong flavour contrast to the subtle flavours so far. Don’t expect slices of american style bacon, but rather 2 thick slabs of cured ham. Salty and smokey, though I might expect some diners to find it a little too ‘strong’. 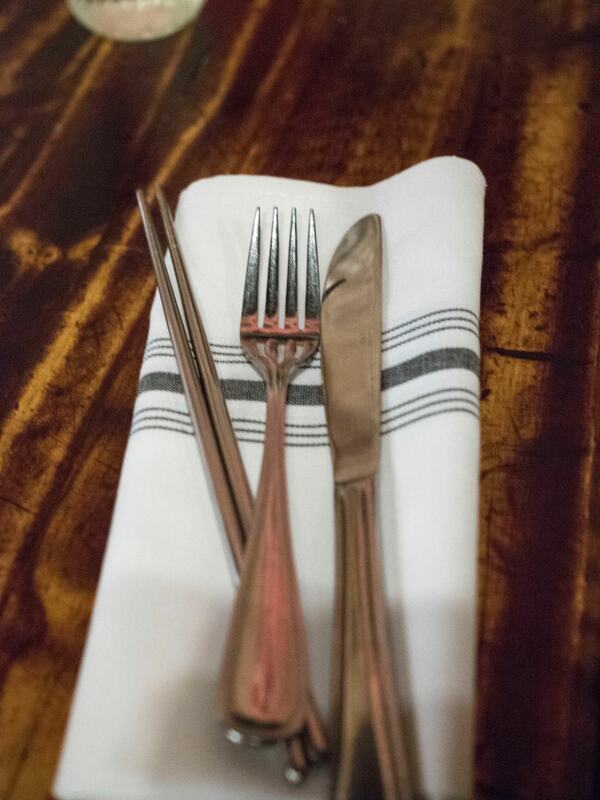 I was very pleasantly surprised at the outcome of our dinner at The Pig and The Lady. Although some dishes were more enjoyable than others, it was the creativity and boldness in the dishes that excited me. 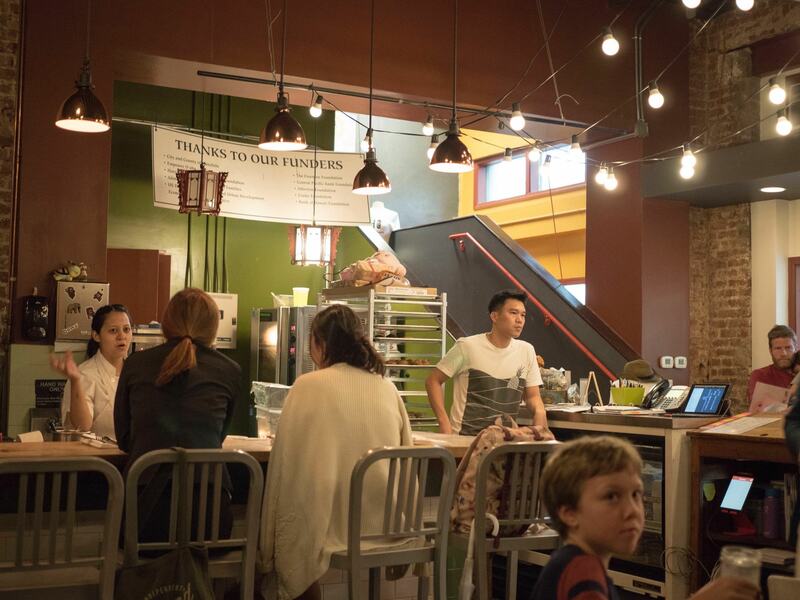 I do feel that they could get rid of the entire pasta section, which felt largely irrelevant to the restaurant and it’s cuisine, and instead replace it with a more extensive vietnamese noodle or rice section.